An exhibition named "Hyperrealistic Sculpture. Almost Alive" has opened at Heydar Aliyev Center on November 29. The art event brought together talented artists from the U.S., Australia, Canada, Macedonia, France and other countries, Azertag reported. 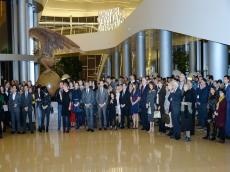 Prior to the opening, Maximilian Letze, Managing Director of the Institute for Cultural Exchange, Germany, highlighted the exhibition, co-organized jointly by the Heydar Aliyev Center. "Works of art were created on the basis of traditions using the most modern technologies and materials. The exhibition is not accidentally presented in Baku, its architecture harmoniously embodies antiquity and modern," he noted. In general, samples of hyper-realistic sculpture can be easily confused with real people, real objects. The artists brilliantly depicted the human body, wrinkles, hair and other details. The exhibition consists of five sections. Art lovers have a chance to enjoy monochrome sculptures, works reflecting different parts of the body and much more. The exhibition "Hyperrealistic Sculpture. Almost Alive" has already been demonstrated in Spain, Mexico, Denmark, Australia, the Netherlands and Germany. The hyper-realistic sculpture that appeared in the 1960s began to develop in the 1970s. George Seagal and Dwayne Henson, who were the first creators of hyper-realistic sculptures, created to the maximum extent realistic, not differing from the prototype of the work. The exhibition features works by Duane Henson, Daniel Firman, Carol A. Feuermann, Jamie Salmon, George Seagal, Keith Edmeier, Sam Jinx, Mark Siyan, Zarko Bashesky, Patricia Piccini, Tony Matelli, Mela Ramos, Matilda ter Hein, Thomas, Thomas, Mrs Ramos, Matilda ter Hein, Thomas, Thomas, Thasin, Thomas Patcini Robert Graham and Allen Jones. The exhibition is open until March 10, 2019.